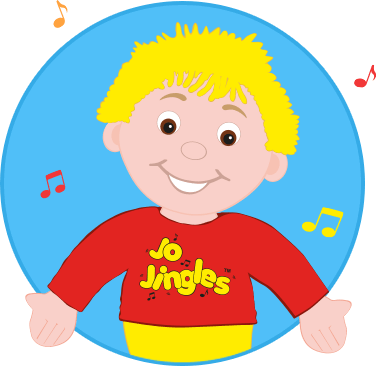 I first experienced Jo Jingles classes when my little boy was three months old and fell in love with the music and songs which made the sessions so fun and exciting. I have a lot of experience with music and have been playing the violin and piano and singing since a young age. I am a qualified music teacher who used to be Head of Music in a Secondary school, but love working with preschool age children in Jo Jingles classes. 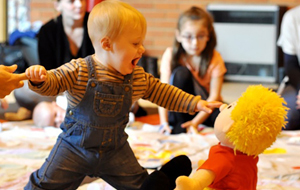 With the help of our cheery mascot doll ‘Jo’ our specially trained and experienced class teachers run the most popular and established music and movement classes across the UK, Ireland and now Australia! 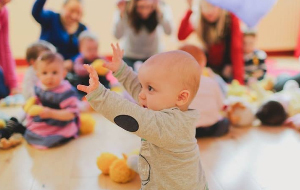 Lasting 30 to 45 minutes, our structured and interactive music and movement classes offer a fantastic educational activity for children from three months to five years of age. He is extremely friendly and actively participates in all of our classes. At the start of each session he welcomes all children with a smile, a wave and a cuddle. Then he might sing or dance or pretend to be a train driver, a monkey or even a teapot. Sometimes he hides and we have to look for him. Sometimes he falls asleep and he needs some help to wake up. Sometimes he is shy and we have to encourage him to join in with the fun. But he always makes time for plenty of hugs and kisses when it’s time for the children to say goodbye. I highly recommend Katy, she is absolutely fantastic! Me and my 6 month old daughter have been twice and love it! I highly recommend Katy, she is absolutely fantastic! Me and my 6 month old daughter have been twice and love it! Really wish we'd started classes when she was 3 months old. 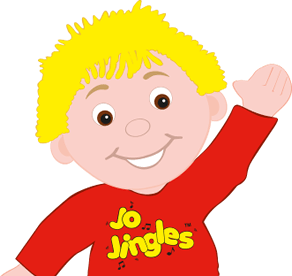 I would like to pass on how impressed my husband I were with the Jo Jingles representative who came to our house to do a party for my 3yr.. 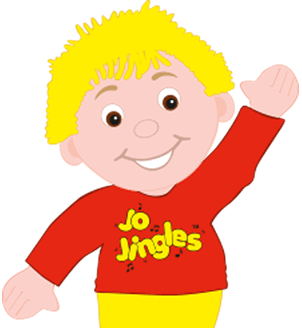 I would like to pass on how impressed my husband I were with the Jo Jingles representative who came to our house to do a party for my 3 year old and her friends. We have had many Jo Jingles parties in the past and Leigha was by far the best. Leigha was so engaging and enthusiastic with the children, she had their attention the whole time! Everyone who came to the party said how happy and how much fun their children had with the music and movement games and songs. Leigha made our daughters birthday feel very special and her bubbly, friendly personality made it magical for her. Absolutely fantastic!! My 9 month old and myself have loved every minute of it, even my 4yr old enjoyed the christmas party! Absolutely fantastic!! My 9 month old and myself have loved every minute of it, even my 4yr old enjoyed the Christmas party! Katy is great really friendly and welcoming. I'd definitely rather go to Jo Jingles than back to work :D hopefully daddy will bring Izzy once she's walking. My little boy can be a little shy but by the end of the class he is joining in and thinks it's "great fun" (his words) Katy is fab! My little boy can be a little shy but by the end of the class he is joining in and thinks it's "great fun" (his words) Katy is fab! Highly recommend her Jo Jingles classes! Please book before coming along to join us, thanks! Jo Jingles Returns to Lincoln! New Classes coming soon to Rampton Village Hall! Why Not Make a Song & Dance Out of it?